Caprifoglio is the Italian word for honeysuckle. This top down earflap hat was named after its flowers, because its seems like honeysuckle is blooming all over it. The flowers are created with a special lace stitch. You make your yo holes like usual. Then, while knitting, you pull loops through them. It looks quite complicated, but it is simple and fun to do. For this hat only one yarn color is used. For more color schemes see Chevrefeuille . RLH (Right loops-through-holes stitch): pick up working yarn from back to front through yo hole (2 rounds below), and place loop on right needle. Repeat for yo holes of 4 and 6 rounds below. LLH (Left loops-through-holes stitch): pick up working yarn through yo hole 6 rounds below and place loop on right needle. Repeat for yo holes of 4 and 2 rounds below. Row 13: k2, yo, ssk, k3, k2tog, yo, k1, repeat till end. Row 15: k3, yo, ssk, k1, k2tog, yo, k2 repeat till end. Round 18: ktog 1 st and 3 loops (back loop), *k9, ktog 3 loops, 1s and 3 loops (back loop), repeat from*, pass last 3 loops over first sts of round. Row 27: *k5, RLH, k1, LLH, k4, repeat till end. 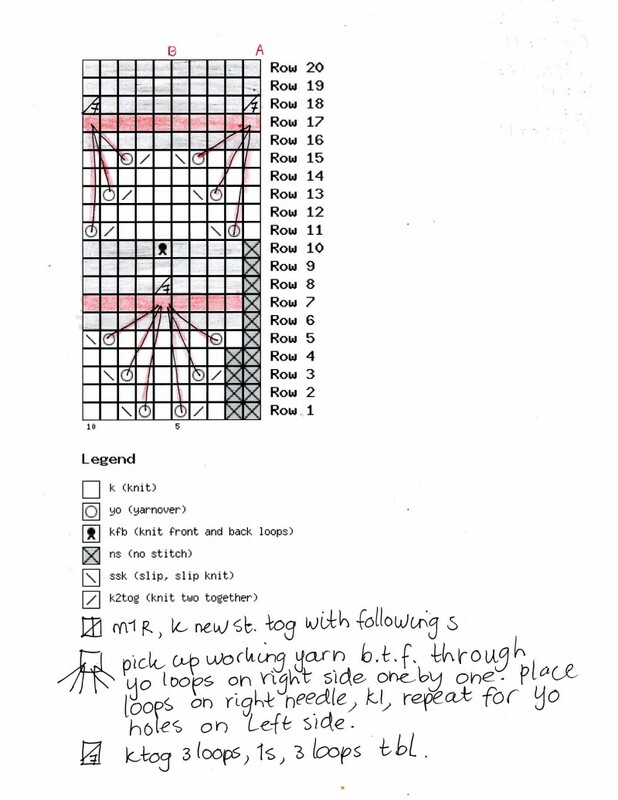 Row 31: k1, yo, ssk, knit 5, k2tog, yo, repeat till end. Row 33: k2, yo, ssk, k3, k2tog, yo, k1, repeat till end. Row 35: k3, yo, ssk, k1, k2tog, yo, k2 repeat till end. repeat from*, pass last 3 loops over first sts of round. Switch to straight needles if you want and knit first earflap. Cut yarn, thread yarn end through sts, pull tight, secure. Connect yarn, BO 23 sts, knit earflap 2 like 1. Weave in ends. Embroider loops on ear flaps like in lace sts. Embroider loopy star on top if you like. Make braids on earflaps and on top.